At the end of the July, the Buffalo Bills will embark upon something they haven’t gone for in quite some time — as they’ll attempt to make it to the playoffs for the second consecutive season. With head coach Sean McDermott and general manager Brandon Beane at the helm, the team is almost completely different than what it was two years ago. As the Bills get ready for training camp in late July, 7ABC will take a look at the team on the field — and more specifically, the top talent that exists on the roster that can help the Bills get back to the postseason. You’ll be introduced to the Bills’ ‘Top 20 Talents’ for the upcoming season in 2018. - The top offensive player on the countdown is no surprise, although he might be a slot or two lower than you might expect. There is no debating who the best player on the Buffalo Bills' roster is right now -- and that is far and away LeSean McCoy. He's had the most success, he hasn't shown any signs of slowing down, and he continues to be one of the best players in the entire league. His innate ability to both avoid contact and hit full speed while making cuts on the field is a treat to watch, and he should be a Hall of Fame player when it's all said and done. However, McCoy is hitting the 30-year-old marker next year and like it or not, there is actual data that supports the drop-off in production once running backs hit that mark. Now, I don't think it will impact McCoy in 2018 as it has to most other running backs just because of his playing style, but I don't know how many more years he can continue the same level of play before father time starts to take hold. For that reason, and that reason alone, McCoy lands at No. 3 on the countdown. 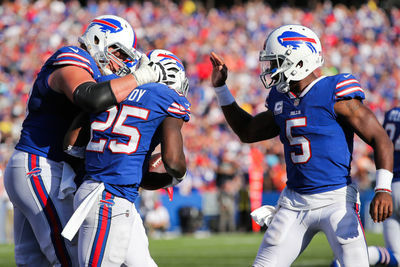 - Regardless of his long-term vision, McCoy will be the most important player on the Bills roster for the 2018 regular season. The offense has so many question marks -- at quarterback, wide receiver, the offensive line -- and the only constant through all of it is McCoy and just how talented he is. With inexperienced options at quarterback, we might see the Bills depend on him heavily -- but also with a plan in place to minimize potential injuries that could bog them down. It's the reason why the Bills paid as much as they did to bring in Chris Ivory, more so to keep McCoy fresh and rejuvenated than anything. He will be the key to the success of the season for the Bills, and if he goes down with an injury, the offense is likely to be in trouble.